Industry Experts released the new market research report “Select Specialty Chemicals Applications – A Global End-Use Industry Analysis“. As per the study, agrochemicals segment leads the market with US$218 billion in 2017 while Asia-Pacific is expected to witness the fastest growth during the 2017-2022 analysis period, owing to the robust growth in Electronic Chemicals applications as this region is the home for large number of companies engaged in electrical & electronic component manufacturing. As the name indicates, Specialty Chemicals are chemical products that are produced keeping a special or specific purpose in mind, with a greater emphasis on performance or function instead of composition. These can comprise individual chemical entities or complex formulations with ingredients that have a major role to play in the processing and performance of final products derived from them. The range of products and services encompassed by the specialty chemicals industry has to be constantly upgraded and innovated for providing greater value to customers. 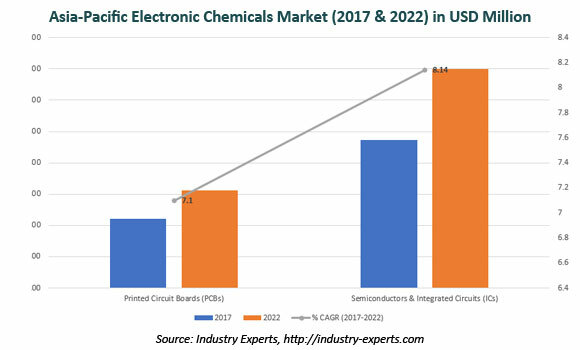 Asia-Pacific is the leading global market for Electronic Chemicals and given the number of companies engaged in manufacturing electrical and electronic components in the region, the markets for the same is also expected to register rapid growth. The construction industry in the developing economies has been witnessing a boom in recent years, thereby bolstering demand for Construction Chemicals. The intake of functional foods and beverages and dietary supplements containing Nutraceutical Ingredients, quite common in the western world, has now even reached the developing regions, which has made this market among the fastest growing. The report analyzes the market for application areas of Specialty Chemical segments including Adhesives & Sealants, Agrochemicals, Catalysts, Coatings, Construction Chemicals, Electronic Chemicals, Engineering Thermoplastics, Nutraceutical Ingredients, Specialty Films and Water Treatment Chemicals. The market for applications of each product segment is explored globally and in regional markets in North America, Europe, Asia-Pacific, Latin America and Rest of World for the period 2012-2022. The market for Select Specialty Chemicals is segmented into five global regions namely, North America, Europe, Asia-Pacific, Latin America and Rest of World. The regional markets further analyzed for 13 more independent countries across North America – the United States and Canada; Europe – France, Germany, Italy and the United Kingdom; Asia-Pacific – China, India, Japan and South Korea; and Latin America – Argentina, Brazil and Mexico. The market is analyzed in all of these major regions by key county and by select specialty chemical type in terms of value in US$. This report focuses on the comprehensive market analysis of each chemical type by its end-use sector. This 725 page global select specialty chemicals’ end-use applications market report includes 527 charts (includes a data table and graphical representation for each chart), supported with meaningful and easy to understand graphical presentation, of market numbers. The report profiles 45 key global players and 66 major players across North America – 32; Europe – 19; Asia-Pacific – 13; and Rest of World – 2. The study also provides the listing of the companies engaged in manufacturing and supply of specialty chemicals. The global list of companies covers the address, contact numbers and the website addresses of 264 companies. California, USA based Industry Experts, Inc is a multi industry focused business information provider.